Twice each year since 2013, Junk Hippy has transformed the Fort Bend County Fairgrounds into a vintage festival like no other. Over 150 vendors from all over Texas and several surrounding states fill three buildings with vintage, handmade and antique goods. Their unmatched creativity, display, product and environment have earned Junk Hippy the title of one of Country Living Magazine’s Top 7 Vintage Sales. Food trucks and live music, all from the Houston area, complete the festival vibe. Think Round Top with a little Woodstock thrown in. Junk Hippy strives to remain authentic and always fresh. Even with their tribe of regular vendors hitting the road together like a gypsy caravan, there are always new vendors to discover at a Junk Hippy show. Designers, DIY enthusiasts, pickers, bloggers, wedding planners, and business owners make Junk Hippy their source for the unique. This is the place to find that one funky piece that completes your project. Or the one that begins your project. Shops, cafes, weddings, and nurseries have been put together with finds from a Junk Hippy show. Homes have been built with the architectural salvage pieces; the chippy old doors, windows, trim, even farmhouse sinks and glass door knobs. 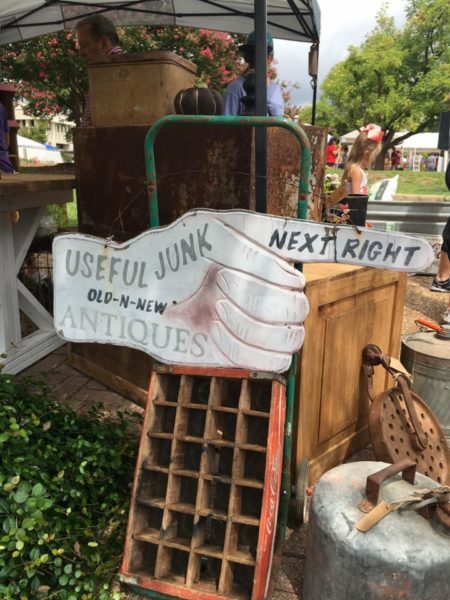 Vintage fringe and cowboy boots, jewelry made from typewriter parts, art made from roadside curb treasures, antique and mid-century furniture and accessories are all things to grab at this event. Junk Hippy takes over the Fort Bend County Fairgrounds Friday and Saturday, March 8-9, 2019 from 9 am – 5 pm. Admission is only $5 at the gate, kids 13 and under are free. Follow Junk Hippy on Facebook, Instagram, Pinterest and Twitter for show updates, news and design inspiration. Always original, always authentic. There’s only one – Junk Hippy.